I love Hack a Day. I've never actually constructed a featured project, but the site has always been a fantastic read to see what's top on the minds of the hacker front. 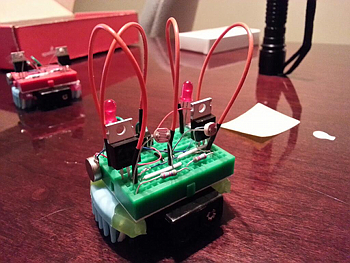 One particular Hack a Day review caught my eye - "a light following bristlebot as a way to teach science." What I found particularly interesting was how well the build instructions were documented on the Science Buddies site. The background was descriptive without being verbose, the parts were easy to come by from both Fry's & SparkFun, and the component count was nice 'n' low. I wasn't sure if the kids would enjoy it, but I knew that at least I would. Now bear in mind I attempted to take MIT's 6.002x class before my brain took an enormous sidetrack and instead ended up with a comparative analysis with Stanford's Coursera. While I did find out what a high-voltage pickle looked like, my understanding of Thevenin voltage is limited to indecipherable algebra illustrating the "Thin Mint voltage" of a circuit. I generally don't know what I'm doing, and exploding diodes are not a rare occurrence. It took me considerable research before coming to understand what the three pins of a MOSFET are responsible for. To this day I cannot quite grasp why a pull-down resistor is required for normal operation (even when there is no "bad wiring"). I need simple, otherwise something is going to end up charred and melted. The project went much better than expected. I performed some initial prototyping to make sure it was easy to teach the kids, and things went surprisingly well out of the gate. We ended up sticking with the project far longer than I expected, and even added our own enhancements to boot. We're now on build #4 and going strong. Directional control is actually quite good, and there was enough room for minor tweaks and improvements on the breadboard. Conveniently enough, when I placed my initial SparkFun order I also slipped in a Raspberry Pi - Model B as well. In the spirit of teaching electronics while remaining completely selfish, I justified the purchase by teaching Python programming using Minecraft while experimenting with GPIO programming on the sly. I was able to have moderate success teaching Python; I constructed a small lesson plan using Martin O'Hanlon's API tutorial as a reference. That turned into a good weekend software development lesson, however I didn't get as much traction with that project as I did with the bristlebots. Luckily for my ulterior motives, I now had a general purpose postcard computer for more breadboard projects. 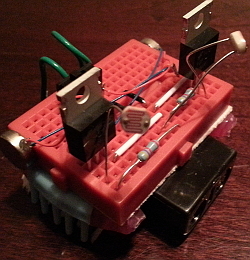 Several tiny wires later, I was able to get a Python script to blink an LED on a breadboard. Between vibrating toothbrush heads and a $40 miniscule flashing light, I started to brainstorm bigger things. Now I'm getting back into 6.002x - Circuits & Electronics and starting over again. I'm much more engaged given this new context - and will likely take the class MUCH slower than the real-time course would otherwise allow. Should be fun.